Spectrometers — devices that distinguish different wavelengths of light and are used to determine the chemical composition of everything from laboratory materials to distant stars — are large devices with six-figure price tags, and tend to be found in large university and industry labs or observatories. 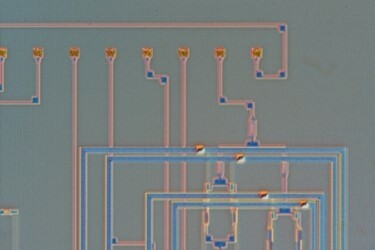 Other groups have tried to make chip-based spectrometers, but there is a built-in challenge: A device’s ability to spread out light based on its wavelength, using any conventional optical system, is highly dependent on the device’s size. “If you make it smaller, the performance degrades,” Hu says. Another type of spectrometer uses a mathematical approach called a Fourier transform. But these devices are still limited by the same size constraint — long optical paths are essential to attaining high performance. Since high-performance devices require long, tunable optical path lengths, miniaturized spectrometers have traditionally been inferior compared to their benchtop counterparts. Instead, “we used a different technique,” says Kita. Their system is based on optical switches, which can instantly flip a beam of light between the different optical pathways, which can be of different lengths. These all-electronic optical switches eliminate the need for movable mirrors, which are required in the current versions, and can easily be fabricated using standard chip-making technology. 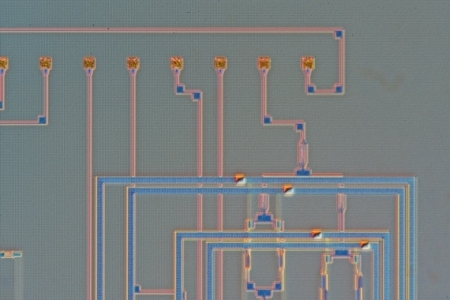 The researchers say such spectrometers could find applications in sensing devices, materials analysis systems, optical coherent tomography in medical imaging, and monitoring the performance of optical networks, upon which most of today’s digital networks rely. Already, the team has been contacted by some companies interested in possible uses for such microchip spectrometers, with their promise of huge advantages in size, weight, and power consumption, Kita says. There is also interest in applications for real-time monitoring of industrial processes, Hu adds, as well as for environmental sensing for industries such as oil and gas. The team also included MIT undergraduate David Favela, graduate student Jérôme Michon, former postdoc Hongtao Lin, research scientist Tian Gu, and staff member David Bono. The research was supported by the National Science Foundation, MIT SENSE.nano, the U.S. Department of Energy, and the Saks Kavanaugh Foundation.